Why should I apply a clear top coat to my epoxy garage floor coating? This is a reasonable question that pops up from time to time for the average home owner looking to save some money. The real question however ought to be why wouldn’t you apply a clear coat? After all, there are many benefits to adding a clear top coat over the color coat for a garage floor. Anyone who has installed a garage floor coating properly will tell you that the hardest and most time consuming part is prepping the floor for the epoxy. Applying the epoxy goes fast and for many, it is the fun part of the job. So after all that work of getting the concrete ready, why wouldn’t you want to spend a little more time and money to ensure a longer lasting and even more beautiful floor coating? With various clear coating options to choose from, epoxy or polyurethane is the most common choice. 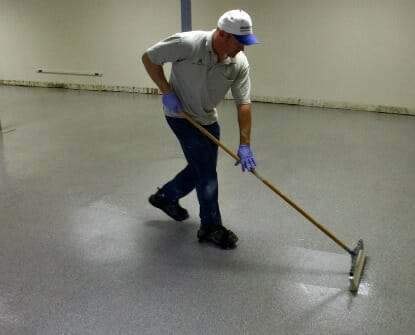 The same benefits can apply to the use of polyurea or polyaspartic floor coatings as well. So to answer these questions, let’s take a look at the top 10 reasons why you should apply a clear top coat to your epoxy garage floor. A clear coat will add durability to your garage floor coating and create for a longer wearing surface. The additional coat also adds thickness to the floor coating which helps to eliminate hot tire lift and absorb impacts better. Because the clear coat acts as a sacrificial layer, the epoxy color coat will be protected. Without it, the colored epoxy coat can lose its luster from wear. Though resistant to most chemicals, some oil spills or leaks that are allowed to sit for long periods can discolor the coating depending on the quality of epoxy you applied. If you applied paint chips or color flakes to your floor, the clear coat will protect them from peeling up and collecting dirt. Since the color flakes are partially embedded into the epoxy, dirt and grime can collect in and around the edges of the flakes making it harder to keep clean depending on how much color flake was applied. Cleaning of the floor and other activities can also cause color flakes to pull up or chip away. When a clear coat is added, the color flakes are protected by the layer of clear that is over them. With a clear coat over the color flakes, the floor is also easier to clean. Dust mops can just glide over the floor without catching color flakes as it goes. This is especially true if you have a heavy flake coverage on your floor. It also allows for aggressive scrubbing if necessary without worry of losing color flakes or dulling the color coat. The additional layer of a clear top coat actually adds depth to the look of the garage floor. This creates for a richer looking surface that appears more luxurious and much thicker than it really is. Depending on which type of clear coat you decide on, the clear will add a glossy shine to the floor that will reflect light even better than the color coat. Polyurethane coatings are sometimes available in different levels of gloss. This is a great benefit for projects in the garage or for working on cars simply because it creates more light. It may also mean that you will not have to purchase more overhead lighting like you thought you might need. All garage floor coatings will develop microscopic and sometimes larger scratches in the surface of the coating. A clear top coat helps to hide or camouflage most of these scratches so they are less noticeable and do not detract from the looks of the floor. The reason for this is that the clear top coat will act as the sacrificial layer and prevents the color coat from being damaged. Anti-slip additives are hidden much better in a clear coat. Since most additives are translucent in color they will not stand out. Without a clear top coat they are added to the color coat instead. This makes the anti-slip granules much more visible as little bumps resembling sandpaper on the garage floor. After many years of use, an epoxy garage floor coating can start to show its age depending on how much activity it has seen. If it had a clear top coat of epoxy or polyurethane, it can easily be roughed up with sandpaper and have a new coat of clear applied. The sanding of the old top coat removes any blemishes, scratches, and other imperfections that the floor coating acquired over the years. Once the new clear coat is applied, your garage floor coating will look brand new again. 10. It just looks awesome! So if you’re on the fence about whether or not to add a clear top coat to your garage floor coating, think about all the benefits that it will provide in the long term. Yes, it will cost a little more money and yes, it may mean one more day of being without your garage. However once you do, you will be rewarded with a garage floor to be proud of for years to come and you will be glad that you did it. There is one important note to make. Clear coats are designed for application over 2-Part resinous coatings and some single part moisture cured resinous coatings. Do not confuse garage floor paint or 1-Part epoxy paint as a floor coating. These are latex based paints that will not form a chemical bond with a resinous coating. Technically, you could rough up the finish of dried floor paint and apply a water based epoxy as a clear coat. It will have a limited increase in durability of the floor coating however due to the fact you are limited by the initial properties of the base paint underneath. Most other clear coats are not suitable due to their solvent base. They can actually soften these paints upon application and cause them to pull up from the concrete. One last question – I promise 🙂 I just finished sweeping and vacuuming up the flecks I scraped the other day and it looks like it could use one more coat of the clear glaze. I last applied it 7 days ago and there hasn’t been any traffic on the floor (no cars and only light walking to sweep/vacuum). Would you think it’s ok to just put this 2nd coat on or would another cleaning need to be done? No worries, Chris. If it’s been seven days, the only real issue is dust that can get caught in the coating. If you can wipe your finger on the floor without getting much then you should be fine. You can always do a damp mop as well if you are worried about the dust. It would dry very fast and not create any issues with the application of the acrylic. I have read several of your articles and they are very helpful. Durability and gloss look are more important to me than time or first cost. Can you recommend a high solids two part epoxy system along with color chips, antislip and epoxy topcoat? Hello John. There are many vendors with excellent product that offer such systems. We suggest checking out Garage Flooring LLC, EpoxyMaster, Legacy Industrial, and ArmorPoxy. They all run specials from time to time so it’s worth checking out pricing. Don’t be hesitant to give any of them a call if you have questions. Hi. We had just painted our basement floor with a 1-part epoxy Behr paint and spread some flakes over it. I’m on the hunt for the best clear compatible top coat to go over it but read so many mixed reviews about certain products. Do you have any recommendations regarding this issue? Thanks. Hello Mary. 1-part epoxy paint is not designed to have a clear coat applied over it. It’s still latex paint with a little bit of epoxy resin added and not a true epoxy coating. This article here will help explain the issue and what your limited option is. I just applied Behr granite grip on my concrete floor. Can I add a clear top coat on top of it? If so what are your recommendations? Hello Keisha. The only clear you can apply is Behr Wet-Look or Low-Luster acrylic sealer. However, you will loose the slip resistant properties if you do. Also, we do not recommend applying their clear sealer if this is for a garage floor or driveway. It has a very poor reputation for peeling and not standing up to automotive fluids very well. I just painted my driveway with Rust Oleum 2part Epoxy paint and was wondering what kind of UV clear coat I can put on? Hello Lily. Epoxy should not be installed outdoors in direct sunlight. It’s an indoor product only. Direct U.V. light will cause the color in the epoxy to amber (turn a brownish yellow tint) fairly quickly and may even cause the epoxy to chalk. Applying a U.V. stable clear coat will not stop this from happening in direct sun since the U.V. rays will still transmit directly to the epoxy. The clear would not amber, but the epoxy still will. Also, a clear coat will make the driveway even more slippery when wet than what it will be now that you applied epoxy. Of course you can always apply an anti-slip additive to the clear, but it’s not going to doing anything about stopping the epoxy from turning yellow. I put Armorseal 1000hs down. So can I put solvent urethane clear over it? Hi David. Yes, you can apply a solvent-based polyurethane over ArmorSeal 1000HS. Sherwin Williams carries their ArmorSeal Rexthane polyurethane which is a common top coat for their epoxy. Thank you for all the great articles. I have a question. I had my garage done by a professional company with epoxy as base, heavy broadcast chips on top, and polyaspartic clear coat to finish. They never scrapped the chips and the sharp edges of chips were showing through the top polyaspartic clear coat and many areas were rough to walk on with naked feet and can easily get hurt. The job was poorly done as they skipped scrapping and smoothing out the chips before applying the clear coat. They came after forty days and applied a clear coat again without sanding or prepping the floor. So they skipped sanding and vacuuming again. Now they want to redo the top coat again by buffing the floor with a floor buffer. But I already see the second clear coat they put is so easy to peel with just bare hands after four days of it curing. I am really confused how they are going to fix this situation. They should probably buff it down to the chips or at least through the first clear coat so their second clear coat is taken out as it’s not sticking to the first clear coat. The contractor says the second clear coat will stick as it’s the same material, but I think he is just fooling. My research on the Internet says they should have sanded the first clear coat and I read a lot of your articles as well. I can almost peel the second clear coat with just bare hands if I get a hold of a rough chip somewhere. I have no clue how that second coat would have worked when I parked a car. Can you please advise on what should I ask the company to do here as I don’t have high hopes on their process? Hello Chan. You are correct in your assessment. They should have deglossed and roughed up the surface first before applying the second coat of clear over a month later. What they need to do is sand down to the first coat before applying any more clear. A common way to do that is to use a floor maintainer with a 60-80 grit sanding screen. They may be doing that, but verify first and make sure they are going down to the first coat. If they are, then it should turn out well. Thanks, Shea for the instant response. This is so timely and useful for me and I can’t thank you enough. I am going to make sure they do all this right. He initially said they will just apply a third coat. Then he said they will sand the second coat and apply the third coat. But I had to convince them to really buff it down to the first coat. But now I will probably stick and around watch them doing it the right away and not take short cuts. This has been so painful and I want it to end and get my garage back. Also polyaspartic coat he is using smells really bad for two days and gives us headaches. 1. How do I make sure they are going down to the first coat in all areas? Second coat seems like so easy to peel off and I just hope the buffer will pull it out without them even trying to do it. 2. If in some areas they go down to chips and sand them down through first coating, does the new coat stick to the chips? As there will be some epoxy as well. Luckily the chips are so heavily done, there is not a lot of epoxy showing through them. 3. Should I care about the coating on the walls around the floor? It seems just fine but it’s rough as well but I don’t care as we don’t walk on it anyhow. It will be pretty obvious if it is taken down to the first coat. There will be areas where it looks real thin or even has exposed the color flakes. It’s OK if they get down to the flakes in areas. The coating will adhere real well since these are rough to begin with. No need to worry about the stem walls. These are always rough since they are not finish troweled when the concrete is poured. They would need a lot of grinding to smooth out and as a result is rarely if ever done. Hello Tim. Many of our sponsors sell polyurethane coatings. This product here is a good example of an excellent polyurethane. Keep in mind that you will need to degloss and rough up the finish of your coating with 120 grit sandpaper and then do a solvent wipe with denatured alcohol first. This is required since you are past the recoat window for epoxy. Two years ago I painted my garage floor with 2 part Rustolium epoxy and followed with a clear coat. It turned out great and still looks like new. To keep it looking good can I apply another clear coat to keep it protected from wear? Yes you can, Johna. It will require that you degloss and rough up the surface with 120 grit sandpaper first. After you sweep and vacuum the dust, wipe it down with denatured alcohol on a lint free towel and then you are ready to recoat. After the clear coat is applied, is it normal to still feel the chips, or should it be smooth? Just had my floor done and I can feel the chips. I think they need to put a second clear coat? Hello Tamie. Yes, it’s normal to feel the contour of the color flakes after a clear coat has been applied. The added texture provides some aid to wet traction as well. In order to get a completely smooth surface over color flakes, it requires applying a clear high build intermediate coat under the final clear top coat. This can be done, but it will increase the cost of the coating and is not often chosen. I just applied H&C Shield-Crete Water-Based Epoxy Garage Floor Coating to my garage floor yesterday. I would like to apply a clear top coat to have a high gloss finish and also to protect the decorative flakes. Is this possible? If so, what kind of top coat should I use? Hello Lupita. Yes, you can apply a clear coat, but if your current coating has cured for more than 24 hours you will need to prep it properly for a clear coat since you are past the window of opportunity to achieve a chemical bond. This will require deglossing and roughing up the surface with 120 grit sandpaper in order for the clear coat to achieve a mechanical bond. If you don’t do this, it will peel from your color coat. This is why it’s always best to make a decision about applying a clear coat before you start the process of applying a coating to your garage floor and not later after it done. You may lose a few color flakes in the process of prepping the surface as well. Rust-Oleum has a clear epoxy that will work well with the H&C epoxy coating. You can find an example of it here. Hello Bill. You would only save a few dollars, plus you don’t want to mix brands if you can help it. The last thing you want to do is apply a cheaper, substandard clear coat on top of a better color coat. I’m in the process of applying the Rustoleum Rock Solid product to my garage floor, but before I do, I have a question. I recently coated the garage floor with CTS Rapid Set Self Leveling Concrete from Home Depot. What kind of preparation needs to be done before applying the Rustoleum product? Do I still need to use the etch? It seems that if I get the floor wet, the water will soak into what I’ve done and prohibit me from moving onto the next step. As for your clear epoxy top coat, what would you recommend for a 2 car garage? Did you grind the repair smooth to match up and level with the rest of the concrete? If you did, then you are ready to go. If you didn’t, then you may want to think about doing that or the repaired areas are going to telegraph right through the coating. If you don’t want to do that and the Rapid Set is readily absorbing water, then you should be OK as is. We always recommend staying with the same manufacturer when you can with coatings. RockSolid makes a clear garage floor coating. Thank you for your quick reply. I actually coated the entire floor with the self leveling concrete. With that said, I should be good to go bypassing the etching step, right? Rapid Set and other polymer-modified concrete products cannot be acid etched. They lack the lime that is present in standard concrete to react and break down the surface. As long as the surface is not troweled smooth and water is readily absorbed, then no other treatment is necessary. If the concrete is troweled smooth, then it will need to roughed up via grinding. However… What product from Rapid Set did you use exactly? Hopefully it was a self-leveling overlay and not an underlayment. Most underlayments are not a wear surface and are designed to have flooring such as carpet, tile, and wood installed over them. Some specifically say not to use a coating. Self-leveling overlays are designed as a wear surface and can be stained as well as coated. I suggest calling Rapid Set to verify that you can apply a coating to the product you used.